The brewery, built in 1913, was closed in 2007. The brewery, built in 1913, was closed in 2007.Note: see EA-784-599 and EA-784-600. 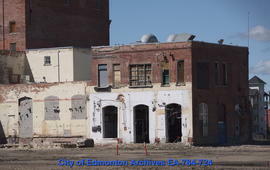 The brewery, built in 1913, was closed in 2007.Note: see EA-784-600 and EA-784-601. 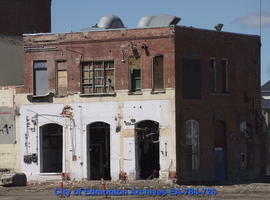 The brewery, built in 1913, was closed in 2007.Note: see EA-784-599 and EA-784-601. Aerial view, taken from 104 Avenue and 120 Street looking north.The brewery, built in 1913, was closed in 2007. The brewery, built in 1913, was closed in 2007; tanks have been removed from the building.